My wife and I have been long-time visitors to Paso Robles wine country in California’s central coast, from as far back as when Scolari’s was the only market in town. We love Paso’s geographic inaccessibility and cultural variation from both Los Angeles and San Francisco—the four-hour drive from either metropolis requires a bit of a commitment. And although Scolari’s has long since closed, to be replaced by Trader Joe’s as the go-to market, Paso has maintained a rustic vibe compared to the day-trippable wine regions of Santa Barbara and Napa/Sonoma. For our Christmas holiday, traversing our route in the Range Rover Velar couldn’t have been easier; the supple suspension made quick work of L.A.’s choppy freeways as we escaped gridlock hell with a daybreak start. As we reached Thousand Oaks, while the air-recirculation function tried its best, the climate control system could not entirely prevent the still-acrid odor from the recent devastating Woolsey Fire from entering the cabin. Hitting Santa Barbara by 8 a.m., we realized we would have to dawdle to make the late-day check-in time at our VRBO. With the drive mode set to Eco, and SiriusXMU’s Jenny Eliscu serving as our personal DJ through the Velar’s soaring Meridian sound system, the Velar’s smooth transit up Highway 101 had us feeling we could drive all the way to Canada. Climbing and descending several grades highlighted the Velar’s well-placed gear ratios in keeping the crossover under control. The Landie proved its off-roading chops on some washed-out dirt roads while trying to find an undiscovered vineyard. As we made a pit stop at Fisherman’s Beach north of Avila Beach, the luxuriant leather seats (both heated and cooled) relaxed our spines as we reclined and cat-napped in a sunny spot—keeping an eye open to watch the enthusiastic dogs frolic in the sand and surf. Thus refreshed, I changed the drive mode into Dynamic, which made thrilling work of the high-speed sweepers of Highway 46 from Cambria up through Green Valley and the Black Mountain summit—the supercharged V-6 helping us claw our way up the grade. Highlights from Paso Robles include the Harmony Headlands, good vineyard dogs, and weird cars in Cayucos. 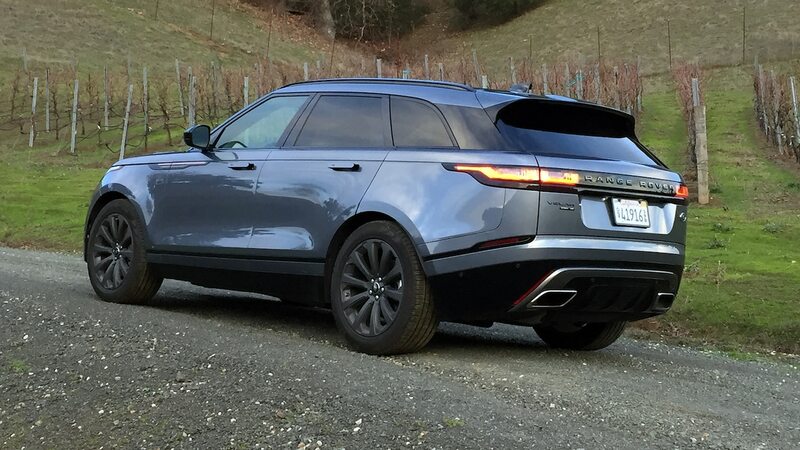 The Velar is sleek and fancy, a Europhile dream that flies just under the radar when parked next to the Xterras and 4Runners favored by Central California’s hikers and surfers. During our week-long roamings of the area, the Landie’s cavernous cargo area eagerly swallowed the provisions and purchases of our week-long stay, as well as several cases of Paso Robles’ finest Zinfandels. Our far-afield VRBO had a resident red-tailed hawk that patrolled for critters in the vineyard. Every morning, it sat on a nearby power pole and spread its wings to warm them after the chilly nights that dipped toward freezing. The morning we left, as we drove away, our hawk bent its right wing crisply inward, in what an anthropomorphizing mind might interpret as a salute. Perhaps our hawk had taken a shine to the Velar. The post 2018 Range Rover Velar R-Dynamic SE Long-Term Update 5: No Whining in Wine Country appeared first on Motortrend.